It was knowledge about this kind of exploitation that brought Pan Africans from all over the world to Accra. I personally had the valuable learning experience of conversing and sharing ideas and concepts with delegations from 25 countries. They included Michael Flores, who has traveled extensively throughout Africa, Ameth Lo of Canada, who did much of the English to French and French to English translating during the Pre-Congress, Samia Yaba Nkrumah of Ghana, the daughter of its first president, Kwame Nkrumah, Alessandro Robaldo and Paulus Uremu of Cape Verde, who told me that it is illegal in their country to change one’s name to an African name. Prof. Miriam Victoria Gomes of Argentina, who noted that the government in that country often acts as though people of African descent in Argentina don’t exist. Hardi Takubu of Kumasi, Ghana, from whom I purchased a colorful, mind-blowing covering that can be hung on the wall if one has a huge living room or used as a spread for a larger than king-sized bed. 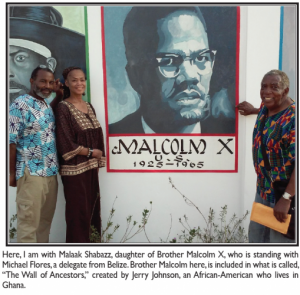 Other North American delegates included Malaak Shabazz, one of the daughters of Brother Malcolm and Sister Betty, Mwalimuk-Q Amsata, coordinator of the North American Region, Jacquiline Johnson-Dickson, who is another frequent traveler and Mobantu Ankoanda, who last fall celebrated the 20th anniversary of her Collard Greens Cultural Festival in Lithonia, Georgia. She told us about her collard greens ice cream. Also memorable was conversing with several former residents of North America who now live in Ghana. For me, the most deeply emotional experience of the trip was going to the El Mina where thousands of our African ancestors were held in captivity until being forced to go through the Door of No Return to be put on ships that would take them to enslavement in North and South America and the Caribbean. When hearing about the major role played by the Catholic Church at El Mina, I thought that, to some degree, it’s retribution for the despicable, horrific contribution Catholicism and Christianity made to the enslavement of millions of African people. The greed-driven exploiters of Africa’s wealth from the continents of Asia, Europe and North America are not going to graciously fade away. However, after interacting with and conversing with the significant number of 40 and under delegates at the Congress, as well as with numerous serious, talented, resourceful and committed young people I know we have in North America, I am more optimistic about the future.